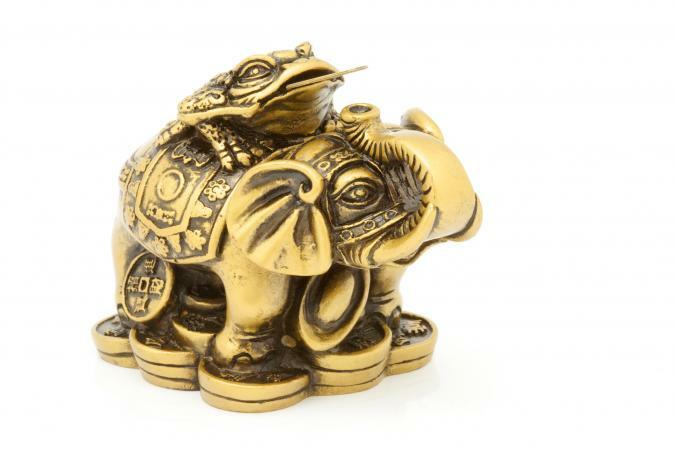 A feng shui elephant is an auspicious symbol if you know how to place it in your home. The location of where to keep an elephant in a feng shui application is determined by what you want to activate in your life. Each area of your home governs certain aspects of your life, so when you place the symbol of the elephant in a room, it will serve to energize the chi energy associated with that area of your life. In the application of feng shui, the elephant is considered a sacred symbol. Although it is often used to symbolize power, wisdom, strength, and fertility, it can also be used to symbolize longevity, good luck and success. It can act as the grantor of wishes and as the protector of the household. There are many applications of the use of elephants in feng shui depending on the material of the elephant and its placement in the home or office. The following are some of the more common applications. Placing a statue of an elephant, or a pair of elephants, at the front door brings good luck, protection and strength to the household. These elephants are sometimes referred to as elephants of many blessings. Most feng shui practitioners believe that these elephants should have their trunks facing upwards as that represents prosperity, good luck and victory. Others believe that elephants with their trunks facing downward represent longevity and conception. Another use of elephants is as guardians and protectors of the household. They help you to keep the powers that you attract and maintain inside the house. The elephants act as housekeepers as they guard the door and bar the chi energy from leaving. An elephant or a pair of elephants displayed in the bedroom promotes love and faithfulness between two people. The statues can also be placed in a study or office to enhance the love between couples. Couples that want to have a child should place elephant statues in their bedroom, as a symbol of fertility. Often a statue or a group of seven elephants is used in the bedroom to activate chi energy for fertility since in feng shui the number seven represents children. A mother and baby elephant statue can also be used to represent fertility. Using elephant symbols to bring knowledge and academic success to children is yet another feng shui application for these magnificent creatures. Place a statue in your child's bedroom, on her desk or wherever she does homework. Depending upon the material the symbolic elephant is made of, it can be used within a specific environment to achieve the proper balance of elements. Elephants that are holding or supporting an object, such as a crystal, can also be used to balance the elements based on the object they are holding. Placing a statue of a frog on an elephant or a monkey on an elephant in the North promotes career stability. Feng Shui products are available from many sources on the Internet. The following are a small sampling of these websites. Feng Shui Mega Mall is part of Lillian Too's World of Feng Shui enterprises. Feng Shui Bestbuy has a wonderful selection of feng shui elephants including Jixiang Ruyi, which is the Elephant for Overcoming Obstacles. In feng shui applications, knowing how to place a feng shui elephant can mean the difference in attracting or repelling chi energy. The main rule for placing an elephant in your home is to always have the elephant facing into the room. If you place an elephant facing your front door, then the elephant's trumpeted announcement will go right back out the door and your life.